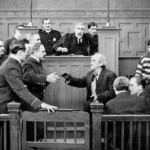 This week we had the opportunity to compare some varied short film melodramas: Barbe-bleue (Bluebeard, 1901, 10 mins) directed by and starring George Melies, The Mothering Heart (1913, 22 mins) directed by D.W. Griffith and starring his frequent collaborator Lillian Gish and Suspense (1913, 10 mins) co-directed by, and starring, Lois Weber. I have summarised the discussion below, but do log in to comment or email me on sp458@kent.ac.uk to add your thoughts. 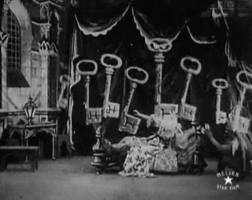 Discussion on the earliest of these film shorts, Barbe-bleue, noted that, in keeping with other films produced at the time, it was filmed by a static camera. However, the fairly frequent set changes and constant on-screen action (including some of Melies’ trademark trick shots of a character – a taunting imp – appearing and disappearing accompanied by a puff of smoke) added impetus to the already melodramatic story. This story was closely related to the gothic with some powerful imagery involving a secret room, keys, Bluebeard’s dead wives hanging from nooses and the latter characters invading his current wife’s dreams. Significantly the narrative centred on a woman (or perhaps more correctly women) in peril, which has been a constant theme in the films the Melodrama Research Group has screened. Appropriately for Melies, known for his magic, Bluebeard’s dead wives inexplicably become reanimated, just in time to be rescued by men who had rather magically appeared. Like Barbe-bleue, Suspense bore close relation to the gothic since they both focus on a woman in jeopardy. The threat to the woman in Suspense is explicitly sexual, however. 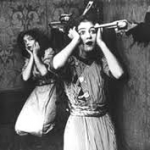 Tom Gunning’s article on the use of telephone in early film “Heard over the phone: The Lonely Villa and the de Lorde tradition of the terrors of technology.” Screen 32.2 (1991): 184-196 was referenced. In this, Gunning notes the fact that both telephonic and cinematic technology manage to bring us near to, but at the same time keep us at a distance from, the subject (either the person at the other end of the telephone, or the characters in the film). We are not in a position to affect what occurs onscreen, while the husband in Suspense is similarly hamstrung by his physical distance from his home and wife whilst they are under attack. 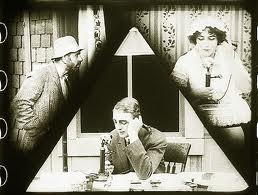 It was noted that Gunning mentions D.W. Griffith’s Lonely Villa (1909) which also uses a telephone in the narrative. As well as an exciting narrative, Suspense included some stunning shots. Especially striking were those from a character’s point of view. One of these was a shot from above of the tramp looking up and threatening the woman, supposedly from the woman’s point of view out of an upstairs window. 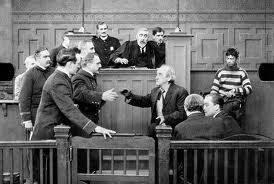 In addition, the tramp was shown to be particularly menacing as he ascend the stairs and looms large in the frame. The split screen which sectioned the tramp, the husband and the wife into separate areas was also very effective. The car chase afforded some great opportunities for inventive camerawork. There was a point-of-view shot from the second car of the first, while the wing mirror of the first car neatly showed those pursuing it several times. D.W. Griffith’s The Mothering Heart was very different to both Barbe-bleue and Suspense. The melodrama focused on the less fantastical, and arguably less suspenseful, issues of marriage and infidelity. 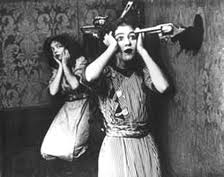 It was preoccupied, as were other films of the time, with the split of the woman into virgin (as represented by Lillian Gish) and the vamp (Viola Barry). Both of whom were interested in the same man (Walter Miller). Discussion of Griffith’s film focused mainly on the presence of Lillian Gish and the similarity of her role to the one she played in Griffith’s Way Down East (1920) in which she also appeared as a mother who tragically lost her baby. While Gish’s character here appeared to act more progressively than in Way Down East – she leaves her husband while she is pregnant due to his infidelity – the reconciliation at the end over their dead baby’s body felt very contrived. Griffith’s inclusion of Apache dancing taking place in the background of the club where the husband meets the vamp was also commented upon. A comparison was drawn between the Apache woman following her man and the foregrounding of suffering Woman – a common theme of melodrama. It was also especially interesting to compare the work of two often-referenced male film pioneers (Melies and Griffith) with a lesser known, though hugely important, female director of the silent era.